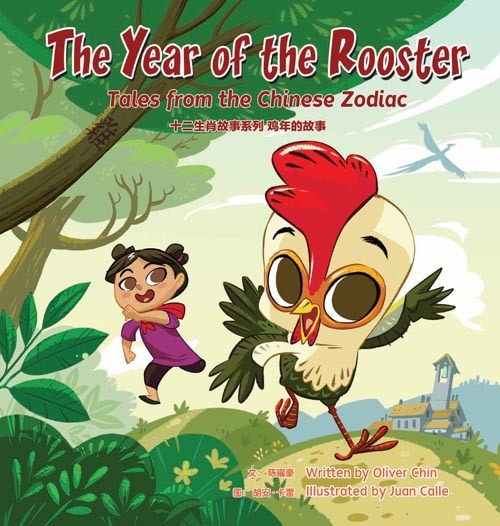 In The Year of the Rooster: Tales from the Chinese Zodiac, author Oliver Chin explains how “the Chinese culture has organized time in cycles of twelve years.” Based upon the movement of the moon, the Chinese calendar matches animals’ personalities with those of individuals born in a specific year. Interior artwork from The Year of the Rooster: Tales from the Chinese Zodiac by Oliver Chin with illustrations by Juan Calle, Immedium ©2017. 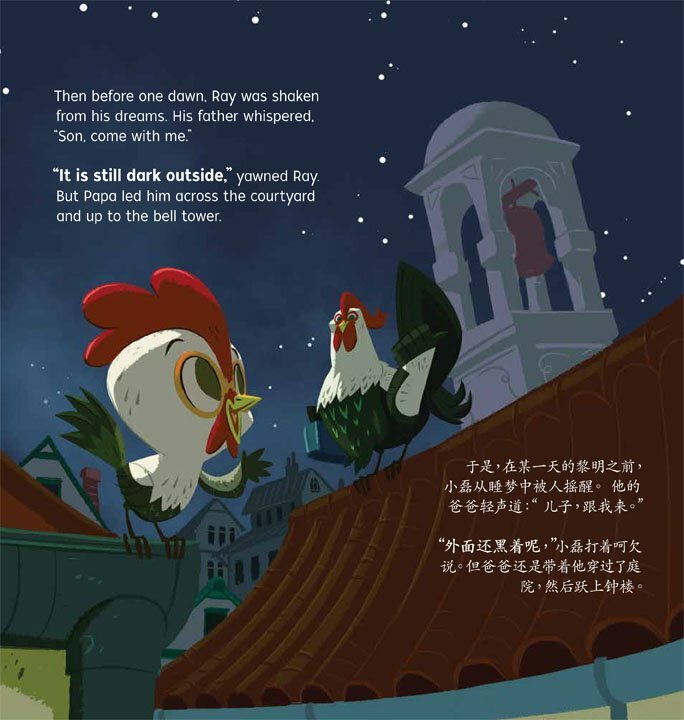 This final picture book, #12 in the series, features a bilingual translation in simplified Chinese and introduces readers to Ray, a plucky young rooster and his loyal pal, Ying, the farmers’ daughter. After bumping into a pig who claims to have found a fantastic phoenix feather, the pair embark on a quest to find the elusive creature. 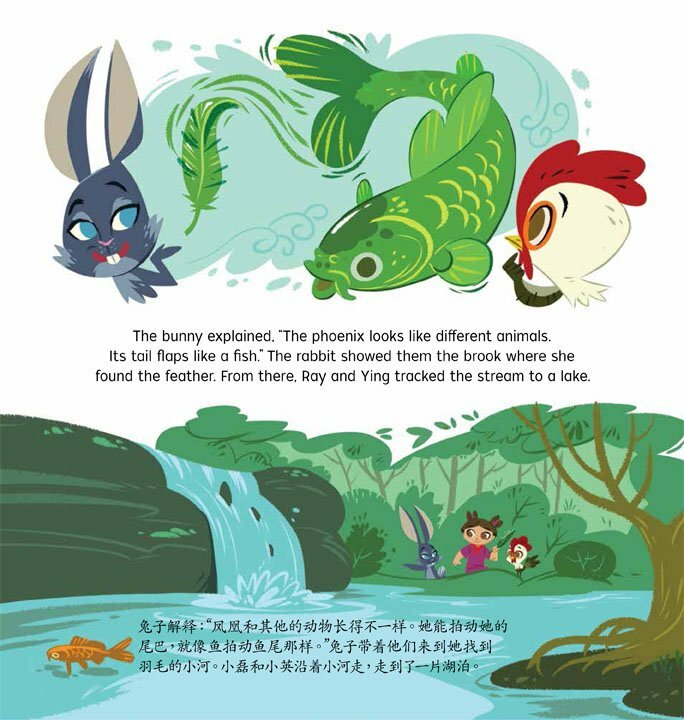 On their journey Ray and Ying also encounter a rat, an ox, a tiger, a rabbit, a dragon, a horse, a snake, a sheep, and a monkey who share their insights on the colorfully plumaged phoenix. As the friends hunt far and wide, Ray is also learning to perfect his crow, something his father has demonstrated early in the story. The significance of meeting a phoenix is raised by the snake who tells the youngsters that “seeing the phoenix is good luck. If you find her, your quest will be well worth it.” But how long must the two travel when it seems that every new animal they meet requires them to trek even further? And if they do eventually find the phoenix, will their quest truly have been worth the effort? 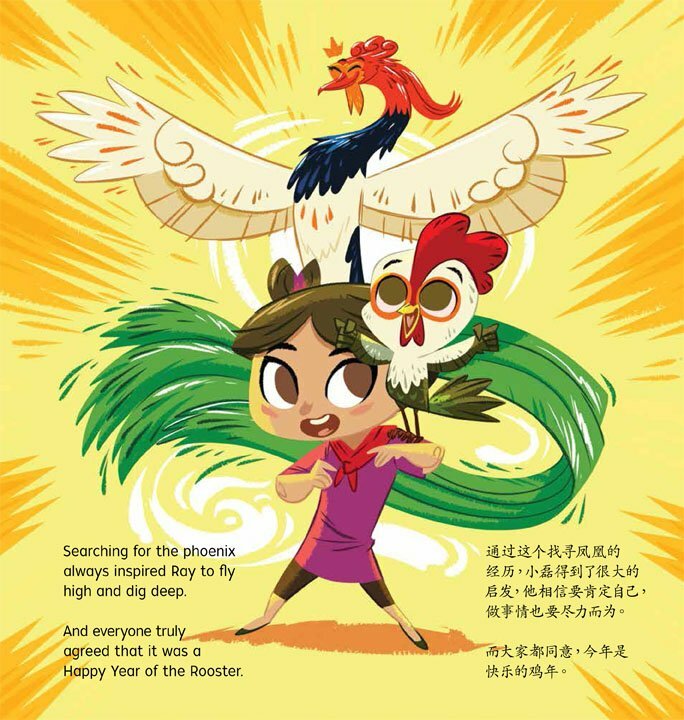 Along with its playful text and easy to follow storyline, The Year of the Rooster’s dazzling illustrations by Juan Calle offer children adorable cartoon-like characters to connect with. As the need for diverse books remains strong, Chin’s book is an important reminder of how invaluable reading and learning about other cultures and traditions is for growing young minds. The Chinese New Year is always a great entrée into the Chinese culture and Chin’s books, as well as all of Immedium’s titles, continue to provide this engaging content. Wishing you all a very Happy Year of the Rooster!